Grows to 14" (34 cm) [Wynne: 12-16"], it has a slender, laterally compressed body with long limbs, and the typical iguanid toes. The tail is up to twice the snout-vent length (svl). A bilateral occipital crest, culminating in a tall helmet (casque) on nape of neck, is followed by a short dorsal crest running the length of the body. When excited, the occipital crest and a small, serrated gular pouch is extended. Scalation is a mixture of granular and roughened; ventral and lower caudal scales strongly keeled. Coloration is ranges from rich browns to olive and gray, with lighter and darker markings. Males are differentiated from females by their larger helmet. When kept together by themselves, males may be quarrelsome. This arboreal iguanid ranges from southern Mexico through Central America to northeastern Columbia in the tropical rainforests. Generally found in the lower branches of trees or in bushes. Feeds on arthropods, spiders, pinks and fuzzies, lizards, earthworms. Supplement with vitamins and calcium. Breeding and egg production apparently occurs throughout the year. Females lay 6-11 eggs per clutch in moist earth or humus. Hatchlings are 3-4". 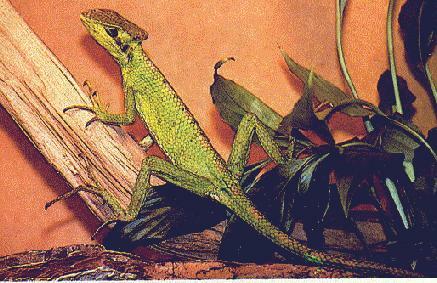 The care of the helmeted iguana is similar to the care requirements of the basiliscus, except that the iguana is not restricted to water. They require a spacious enclosure furnished with strong plants and branches. Water should be provided in a bowl and by spray. Humidity can be maintained by gently heating the water bowl. Temperature ranges from 80-90F (27-32C) [Wynne: 75-85F] provided by radiant heat. Night temperatures should not fall below 68F (20C). Occasional ultraviolet light is acceptable. Obst, Fritz J., et al. The Completely Illustrated Atlas of Reptiles and Amphibians. TFH Publications Inc., Ltd. Neptune NJ. L. longipes Helmet lacks serrated crown; no dorsal crest (pictured). L. serratus Helmet has distinct serrated crown; back has low serrated crest. 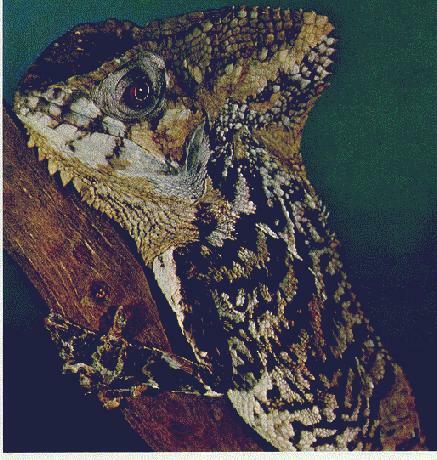 This genus of the Iguanidae is found in Central America, ranging in the heavy tropical rainforests from southern Mexico to Honduras. These very slender lizards may attain 28" (70 cm) in overall length, with their tail almost three x the snout-vent length. Very long skinny limbs and toes. They have a small backwards-pointing casque or small helmet on the head. They are green or brown with darker crossbands; sometimes with lighter longitudinal stripes. These arboreal lizards rarely leave the trees. They need a large, lush, humid enclosure. Keep water in enclosure, though they do not often bathe. Consider intermittent misting system. Daytime temps must be to 95 degrees in basking area, slightly cooler through out. Nighttime drops to high 70s-low 80s. Insectivorous. Oviparous, laying 3-5 eggs. Care otherwise as for Corytophanes.